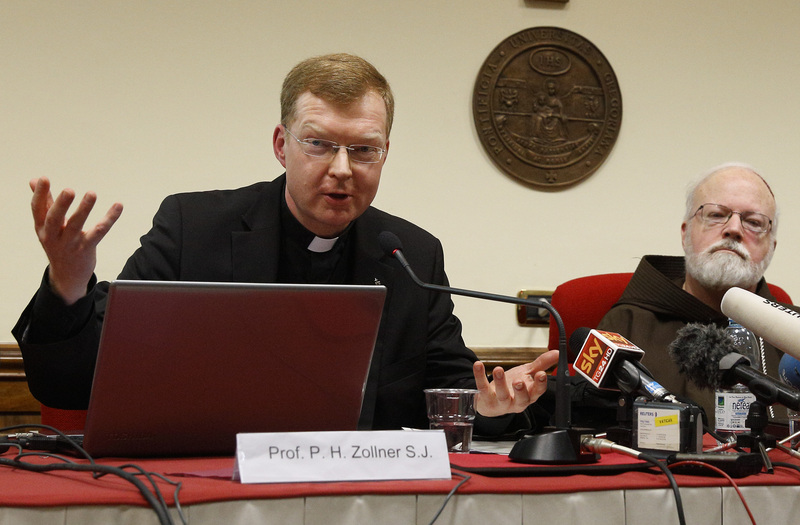 Hans Zollner, S.J., is a licensed German psychologist and psychotherapist with a doctorate in theology and one of the church’s leading experts in the area of safeguarding minors. He is the president of the Centre for Child Protection at the Pontifical Gregorian University in Rome, a member on the Pontifical Commission for the Protection of Minors and a consultor to the Congregation for the Clergy. America spoke with Father Zollner in July and followed up recently as the sexual abuse crisis in the United States continues to roil the church. This is the first of three interviews James McDermott, S.J., is conducting about the abuse crisis. What is your reaction to what we’ve seen in the United States and elsewhere over the last month? The strongest impression I have is that it has now reached another level. The discussion and the awareness and the intensity, especially in the United States, is very surprising because you have gone through this for many years already. And it brings out the American [social and political] divisions that are visible in the country and in the church. But why is it so shocking for so many, left and right of the divide? It is because the extent of the cover-up by church leaders in the past and their co-responsibility for it (no matter what their ideological persuasion) are becoming clearer now. And then the question is how people deal today with all these issues. The McCarrick issue I also see somehow linked to the #MeToo movement insofar as #MeToo gave people permission to really confront the untouchables, to get at those persons you never dared to talk about or accuse. Those who were once attributed with “divine personalities” are now within reach—close enough to be questioned and criticized. And when it comes to the church, the main focus is no longer on abusive priests but on bishops who covered up. That is something very new, very recent. It has been there, yes, but the intensity now shows there is another level of sensitivity and another level of need for transparency and authenticity. It is interesting to hear you talk about how the untouchables have become altogether approachable now. The attacks on the pope would seem like the ultimate expression of that. Yes, the pope is no longer untouchable. And I think that is a result, first, of Pope Benedict’s resignation, which has shown as clear as daylight that a pope is a human being. He has demystified the papacy by stepping down; then Pope Francis’ being so real, so accessible, is certainly also one of the factors that allow people to feel entitled to attack the popes, very personally (and without, I would say, the necessary respect). And I believe this is precisely in the line of Francis’ understanding of the papacy, of the episcopacy and of ordination—sacrosanct priests are now a thing of the past. Just as you can criticize politicians and other officials if they don’t do what they’re supposed to do, you can openly speak about the hierarchy’s failings. The extent of the cover-up by church leaders in the past and their co-responsibility for it are becoming clearer now. What do you think are the next concrete steps the church in the United States has to take? I would say the bishops need to commit to a code of conduct, and procedures need to be put in place in case there are more allegations of cover-up. It could be a model for the whole church, if they committed themselves to a process. For example, there is a bishop that is accused. Okay, we will call together a jury, or whatever you might call it, of people, a mixed commission, and they will sort out things; they will test the allegation and if there is a confirmed allegation, okay, we report to Rome. A consequence of such a proposal could also be that they determine procedures in Rome. Pope Francis, with his motu proprio “Like a Living Mother,” has made a start, but we don’t know whether that was followed through and what kind of process is in place in case an allegation comes up. What do you mean by “a mixed commission”? Laypeople, priests, bishops—all experts who are capable of taking evidence. One of the problems that we have is that in canon law we don’t have a detailed and clearly defined list of punishments for clearly defined crimes, so we will need that. We will need to know what will be the concrete measure of punishment for a bishop who has covered up abuses. Also, let’s say you’re at a Catholic school and it is “Brother Brown” who abuses. To whom do you write? It is not the Congregation for Clergy. It is not the Congregation for Doctrine. It’s the Congregation for Religious because we’re talking about a brother, not a priest. But again, until now the punishments for a non-cleric who has abused a minor are not specified. There is no church-specified punishment for any layperson either. That is also something that I would say we need to revise. At a recent talk you mentioned the Vatican II-era “Catacomb Pact” as a reference point that could be useful to bishops today. Could you elaborate on that? Forty-two bishops of the Second Vatican Council met together at the end of the council in one of the early Christian catacombs and committed themselves to a simple lifestyle, to giving away signs of power and prestige, effectively giving away control and asking for lay men’s and women’s involvement in decision-making commissions. And they committed to prioritizing pastoral work that put vulnerable people at the forefront. We are at a moment of real crisis in the church. I think nobody can deny that. So what does it mean? We need to come back to our roots. And the roots have always been the simple, committed and consistent lifestyle that Jesus Christ lived and asks us to live, focusing our attention on God and our neighbors, not on our own seemingly indispensable comfortableness and signs of power, prestige and privilege. It means really sharing power, asking lay experts for advice and following it, having functioning checks and balances in church administration, not showing favoritism when choosing personnel, promoting honest and constructive feedback, forgoing personal favors and privileges. The martyrs buried in those catacombs remind us that the Gospel costs something, sometimes death. But even if there is no martyrdom in the physical sense, at least there can be some kind of evidence in our own lives that following Jesus Christ has a cost. What do you wish bishops understood right now? I hope that bishops understand now once and for all that they have to live out what their mission and responsibility is—morally, canonically and spiritually. And beyond sheer and simple compliance: Are they determined and committed with their whole heart to do whatever can be done so that no more people are harmed and all who have been harmed receive justice? That means following wholeheartedly Jesus’ call to put the most vulnerable ones at the core of our attention and mission. This is not an add-on—as it has been handled until now by many—as if it were an additional task that needs to be addressed now, but after some time we can go back to our “real” ministries. This is the DNA of the church and needs to be automatically in all our thoughts, planning and actions. My point has always been that the law alone does not solve problems. Yes, we need standards and strategy. But culture eats strategy for breakfast, and law does not change culture on its own. People are not complying with the law (e.g., they commit murder, cheat, although they know it’s wrong and will be punished), and why are they not compliant? Because they aren’t really convinced. With regards to safeguarding, there is an interplay between policies, norms, procedures and guidelines: canon law on one hand and on the other one’s attitude and willingness to cooperate—not because I am compelled to but because I readily and spontaneously and naturally do whatever can be done so that young people are safe and those who have been harmed receive all the help and support they are entitled to. I’ve heard you talk about the need for theologians to play a part in this conversation as well. Can you explain that? The role of theologians would be and should be that they reflect on the presence of this evil, all the consequences for the victims, for secondary victims, for the church that is impacted by this abuse crisis. How can it be that the Church of Jesus Christ has brought about in its leaders so much evil, self-preservation, lack of courage and negligence of the lives of children that went unnoticed or repressed or denied or covered up? Also, a major question theologically for me: What is the role of the priest today? What does a priest do today? We see in most countries, in the West at least, that they do all kinds of things that don’t have to do necessarily with priestly pastoral and spiritual ministry. They do administration, bureaucracy, organization, for which they don’t receive specific training and supervision. Can you bring from within the theology of priesthood (and you may add episcopacy) what is essential and how should it be defined today? In the same line: How do we understand being a church in the world today? What do we need to learn in relationship to modern society, modern science, modern administration? There is a model of theology that is disconnected from all this, and people may say theology is a completely different cup of tea, but do we not need to reflect within the context of the day-to-day life in which we live? For example, in an era of mass communications, of social media, of transparency, of authenticity, etc., don’t we need to reflect on its impact on our faith life, the relationships among us, our relationships to God? I read this first while having my heart starter today, and was roused to such indignation it was as if, should I carry on, my fuses would blow. "Get back to Christian roots" started it all off. My reflex response, "get back to our Jewish roots, please God"! Every Jewish child was seen as a child of Abraham and an inheritor of the promise. The bedrock of the culture of the chosen people. Not so in the lives and practices of "Christianity" from the time of Constantine, the un-baptised adopter of the new religion as the binding force of his imperium. We see slavery, buying and selling of children and child labour under appalling conditions through to designating and mandating marriages between males and females long before puberty. Just recall the poor male children with beautiful pre-pubescent voices castrated to produce singers of praise and worship of the Lord aesthetically pleasing for the powerful. Google 'castrati' if you are new to this fact. I accept his insight that the changed climate in the ordinary people of town and country in the Western world has currently blessed us with ease at confronting people of power and influence who misbehave. "Sacred cows" may yet be killed! So, that professional "holy people" break the law is an insight? If so, it reveals terrible widespread blindness within their ranks up to now. And then, he fantasises about setting up a court IN THE CHURCH. Has he seen and learned nothing? Both the perpetrators and their protectors have broken the laws of many of our lands, they must be arrested and charged and tried by the administrations within which they reside and be punished according to our civil and criminal laws. And what on earth does he think THEOLOGIANS can offer? God has been very clear about sinful human nature, nothing new there. By whatever name, ECCLESIOLOGY must be the focus. Professional Catholics are almost totally corrupted by the wealth, power, prestige and institutional properties of the human structure and government which has grown through the centuries. EXCELLENT!!! We are part of the great story of God reconciling to Himself what was separated and broken - ending our exile! And what have the exalted grand poo-bahs done with this treasure? They have turned it into cheap, man-made religiosity designed to enhance their status. Instead of helping us find our part of the story, dispensing religious products and services along with a big helping of fear and guilt to keep us in line. You're exactly right. The narrative itself is bogus. The good news is that the DNA of the promise is still here and God never abandons his people. No, you call the POLICE. Don’t give the clergy or the Hierarchy a chance to hide the alleged perpetrator or to destroy evidence. The Roman Catholic church is relying upon other RC clergy to resolves the problems in the US and the Vatican. Distinguished male and female clerics from all corners of Christianity should be assembled to "dive deep" into the plague corroding our Church. Assemble church leaders from Anglican, Lutheran, Protestant, and Jewish traditions with advanced degrees in psychology, criminal justice, civil law, psychiatry, Relying upon RC clergy to address the "modern toxic plague" of other RC clergy is not working. Many of these disgraced clerics are allowed to remain in their respective religious orders and receive free room and board for the rest of their lives. How foolish! Pope Francis wisdom is so great, he already had a vision of what was coming into the Church. Pope Francis before this homosexual scandal was fully expose had already called all the Clergy to Conversion. He knew the Church is destined for purification & great tribulation CCC675. The Clergy must wake up from their slumber, and Amoris Laetetia is the inspiration of the Holy Spirit to wake up the Clergy, to separate the Disobedient from obedient & faithful Clergy. Pope Benedict XVI had predicted the state of the Church in the end times, it will become small but compose of a more spiritualized members. The grandiouse & edifices that it has built for 2000 years will be gone..perhaps the Vatican will go bankrupt as Satan forces controls most if not all the institutions to prosecute the Church of his crime committed..that in reality originates from satan evil infiltration of the Church in the early 1900's. St.John Paul II during His Papacy already saying the Church is now facing the Final Confrontation..
Pope Francis highlight this now, saying the Great Accuser is somehow unchained. The Clergy must seek conversion to become docile to the voice of the Holy Spirit, if not they will be an easy prey for satan forces of darkness. But, Catholics must not lose hope, the ending of this war is already concluded in Fatima. Pope Francis is a Luminous Pope, may God give him more graces to lead the Church to Victory. You may be helped by realizing your mind is almost totally overtaken by the worst effects of Religiosity. The essential question: "What is the role of the priest today?" Post crisis? Back to Chrtian roots? Seriously? This post is more of the same - obfuscation, deflection, & projection of responsibility. The more you look to get beyond this depraved history of Catholic heirarchy, the more revelations of its existence surface. It appears Rome continues to have many wolves in sheeps clothing. As for the call for “conversion of hearts”, need we be reminded that that is not something we do but that which is done - a work of the Holy Spirit. I thought this was a good, relevant, introspective article. Before there can be any meaningful reform there has to be a reexamination of purpose, both for the Clergy as well as the Laity. Our Christian roots should remind our Bishops to be missionaries and our priests our spiritual advisors. The Laity have to take up the mantle of being the physical administrators of ur faith communities, which is a responsibility that will take some getting used to. It is a natural phenomena that when goals are set on foundations of truth and virtue, that which is not virtuous will not find a resting place. There is Hope when we put our Faith in the Love of God. A macro failure of the church that I see is that too many Catholics have not understood the nature of the Church. Those who do I think, are bothered by the issues of abuse, but are able to distinguish between the indestructibility of the Mystical Body and the inherent weaknesses of the human organization. Catholics need to be inoculated against failures that have occurred, and will certainly continue to occur all the way back to the Judas betrayal. Something else: While it is true IMO that the laity should do more to take over the administration of the temporal affairs of the church, more attention needs to be given to training laity in the administration of church affairs. Simply saying that the laity should do the temporal administration is not enough. Excellent corporate administrators are not necessarily good church administrators. In fact I'd rather have a well-intentioned but untrained priest run my parish than nearly any administrator I worked with during my career. Many were simply poor administrators, but even those who were very good secular administrators would not have the good judgment or sensitivity necessary to manage a parish or diocese. Such administrators need to be trained. Where are those academic programs? "The role of theologians would be and should be that they reflect on the presence of this evil, all the consequences for the victims, ... How can it be that the Church of Jesus Christ has brought about in its leaders so much evil, self-preservation, ..."
Scripture, Tradition, and contemporary disciplines (including best practices of non-profit management) and our growing wealth of experience should all contribute to this important moral discernment about our future. I would hope that if there are already good ideas within the academy, the bishops and decision makers will be willing to consider them. So, maybe I’m not understanding this article. Why are “we” ajudicating these crimes? They are CRIMES. These are not differences of opinion. Why not let police handle this? And I object to the use of the word “post”. This isn’t over. We’ve seen evidence of coverups in Boston, Pittsburgh, Brooklyn, Germany. But what about the rest of the country and the world. Until the evidence is exposed in every church and archdiocese, it’s still a coverup. I’m disappointed. No, I’m heartbroken. We can’t settle for what’s been exposed. We need to open it all up and deal with it. “We” are not above the law. Daily indulging in bread labor is a long forgotten secret for a healthy and respectable living. Cardinals, bishops, provincials, rectors and such other fellow mortals in uniforms could be commissioned to earn their daily bread through the sweat of their brow. Such life-draining activities will offer new moral concepts for an edifying onward journey. If you want to know what is going on in the American church just follow th money. Don't forget physically and psychologically abusive violence. "Also, let’s say you’re at a Catholic school and it is “Brother Brown” who abuses. To whom do you write?" I would like to put in a word for recognizing that there also was widespread physical violence committed in Catholic educational and other institutions in the name of keeping order, discipline, "building character," "in loco parentis," etc. Much of this was considered normative by parents and by society in general. But the perpetrators oftentimes were sadistic brutes -- nuns as well as brothers. Today, such behavior is not tolerated or even thinkable. But a few old guys like me are still around to remember.